When fashion model and designer Anina returned to visit her hometown of Traverse City from China earlier this year, she sought to encourage and excite others about the intersection of fashion and technology. The first-name-only Traverse City native grew up with brothers who went to code camp at Pathfinder, and she was always comfortable around and fascinated by computers, math, and science. She soon found success there as well, being named China’s top foreign model in 2009. What’s more, Anina was able to combine her interests: The first blogging fashion model, she graduated to working with the likes of Nokia, Samsung, IBM, and Microsoft, creating large-scale events that married fashion with technology. She has spoken at technology conferences such as Dutch Week of Innovation, TechNode and Mobile World Congress. She’s the CEO of 360 Fashion Network, creators of the LED ribbon and other “smart” fashion tech kits. Now she’s helping and inspiring local designers to incorporate technology into their clothing designs. When she visited Traverse City this spring, she brought with her examples of lighted LED ribbons incorporated into items like dresses, scarves, and purses. Anina also sought out opportunities to connect with others and spoke with a number of groups: the chamber of commerce, tech entrepreneurs, maker groups, and students among them. If she was looking to inspire others, consider her mission accomplished. Rose Soma of Traverse City was one of the students excited by the combination of technology and fashion, though she admits she had a head start. “I want to be a fashion designer. My mom has a degree in home [economics], and taught me how to sew when I was little,” Soma said. Soma has displayed some of her efforts at the “Trashion” show at Traverse City West High School, creating useful, attractive items from things that were otherwise going to be thrown away. Soma first became acquainted with Anina online, but when she saw Anina showcase the LED ribbons locally, Soma saw potential for using them in items as disparate as necklaces and backpacks. In the former, she uses the lights to accent the colored glass in the necklace; in the latter, she showcases the ribbons through clear vinyl (pictured above). While fashion is often seen as “girly and delicate,” according to Soma, technology is anything but, conjuring images of factories or computers, both of which are dominated by males. “It’s cool to see them come together,” Soma said. Olivia Rockwood also was inspired by Anina. 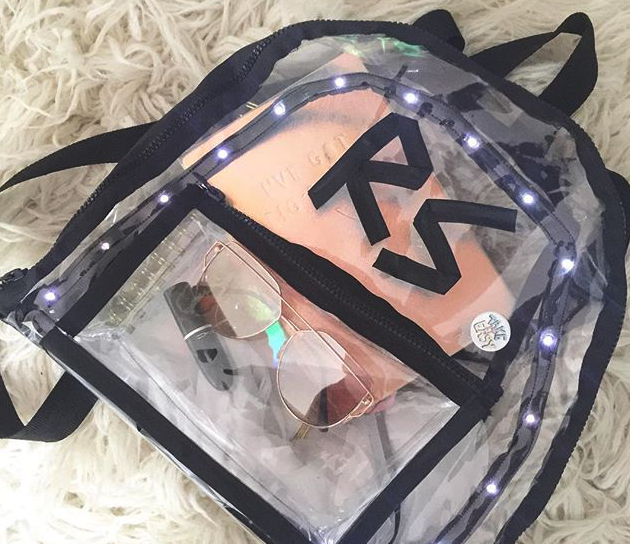 Interested in both technology and fashion, Rockwood embraced the concept of combining the two and sees their merger as a means to get more girls interested in science and technology. “I was always into technology and engineering,” said Rockwood, who will be a junior this fall at Traverse City Central High School. Like Soma, she’s participated in the Trashion show. When she saw Anina’s LED, Rockwood decided to use Auto CAD to make a needle she could 3-D print, then used the needle to weave an LED ribbon into a hoodie she owned, creating a light-up hooded pullover. Aaron Harris, who met Anina at TC New Tech, came up with an application that Anina had never considered. Harris, a young inventor who had been working in the world of virtual reality, found that some people didn’t like the appearance of his bulky VR headset. “A lot of kids didn’t want to put them on because they thought it looked silly,” said Harris. Meanwhile, Soma is looking forward to a fashionable future, and integrating technology will be part of it. She’s set up an online portfolio of her creations, and this fall will be attending Western Michigan University to pursue her dreams. “I’m going to college for fashion and marketing,” she said. Soma has her own website (rosemariesoma.com) and is on both Instagram and Youtube. The latter is where she posts tutorials on transforming a vintage dress, a tablecloth, or some blinking lights into fashion wear.